The first quarter of the current financial year hasn’t been a good one for Square Enix (TYO:9684). The Japanese development and publishing house has seen falling sales and operating income on the back of having no new releases and under-performing mobile titles. In the report published by Square Enix, the figures show just how diminished these results are. For the three months ending June 30th, sales came in at ¥45.4 billion compared to last years ¥57bn. This is a year-on-year fall of 20.2% or ¥11.6bn. Operating income also took a large fall, from ¥12.8bn to ¥4.2bn this year, a YoY fall of 66.9% or ¥8.6bn. As stated above, the primary cause of this plunge in sales and profits can be directly attributed to the gaming segment of Square Enix. Digital Entertainment saw a fall in sales of ¥11.7bn, from ¥44.1bn to this years ¥32.4bn. This segment is then split further into ‘HD Games’, ‘MMO’ and ‘Games for Smart Devices/PC Browser’. All three saw diminished returns, though MMO’s and Mobile/Browser were still profitable. HD games, in particular, suffered from sales of just ¥6.3bn. The publisher released no new premium titles during the quarter. As a result, all of these sales were on the back of back-catalogue titles. Operating income was non-existent. However, this was a result of planning for the future, the spending on advertisements for titles that were to be released in Q2 and beyond. 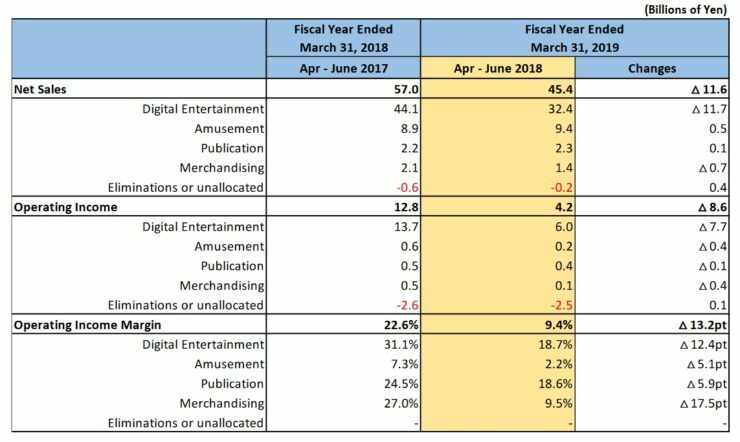 During the three-month period ended June 30, 2018, having no new game release, net sales decreased in the area of console games compared to the same period of the prior fiscal year. The posting of advertising costs in advance of the release of major new titles in Q2 and beyond resulted in an operating loss, but download sales of previously released titles remained brisk. Nothing exemplifies this better than the figures for actual games sold. Worldwide, only 2.35 million units were sold during the quarter. This includes episode sales of episodic titles like Life is Strange, which came to 0.64 million units. 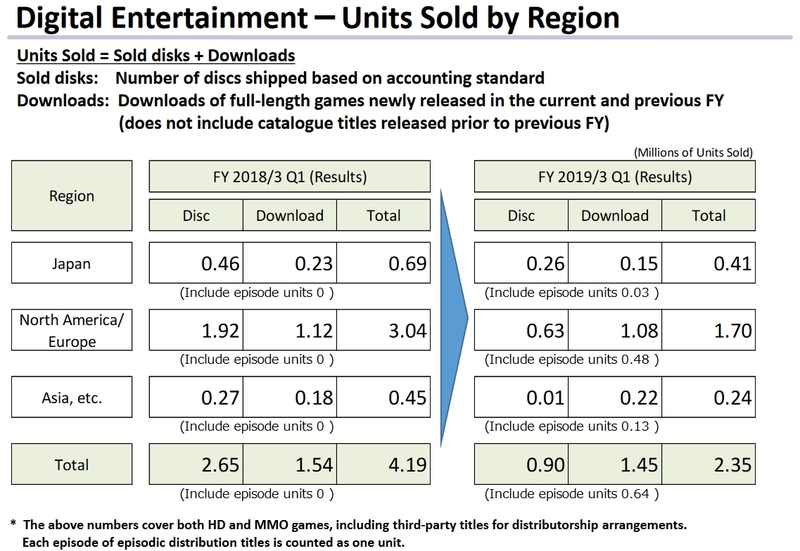 The same quarter last year had 4.19 million units sold, with none being from episodic games. The difference is large and highlights just how bad a quarter with no new releases can be on the figures. Fortunately for Square Enix, Mobile as a segment was still reasonable, having only fallen to ¥19.6bn in revenue from last years ¥23.7bn. One cause for a fall in revenue was a lack of lump sum payment for licensing, which they did receive last year. Discounting that, the segment still fell below expectations. Plans are in place to expand some of the titles globally and to also look at revisiting development of mobile titles in the hopes of creating a hit title. With MMO’s, the company is seeing falling revenue every single quarter. From Q1 2018 to now, Q1 2019, revenue has been ¥9.3bn, ¥8bn, ¥7.6bn, ¥6.8bn and now ¥6.3bn. This can be explained by there being no expansion pack for any of the company’s titles, but also the natural fall in user retention. Square have noted that “average revenue per user (ARPU) remained strong. However, there are no plans in place for another expansion. To combat and retain players, the company are hoping to roll out major updates to their titles that keep players interested. Much like other Japanese companies we’ve covered recently, Square Enix also has a segment that deals with amusements and other similar machines. Amusements actually saw a YoY increase in sales of 5%, rising from ¥8.9bn to ¥9.4bn. While this is good for the company, it has been a notable trend that this is the third consecutive quarterly fall. It has been attributed to the fact that, as with games, no new machine was launched during the quarter. During the three-month period ended June 30, 2018, solid amusement facility operations resulted in a year-on-year increase in net sales, but operating profit decreased compared to the same period of the prior fiscal year as no new amusement machines were launched. The company does have two new machines in the pipeline to launch within the current financial year, which should provide a needed boost. It’s a running trend that Square Enix simply hasn’t launched, developed or published much during the quarter. It’s only natural that the trend continues for the publication arm of the company. There has been a YoY increase in revenue from ¥2.2bn to ¥2.3bn, but the figure is lower than any of the previous three quarters. During the three-month period ended June 30, 2018, sales of printed comic books were sluggish due to limited new releases, but brisk sales in digital formats led to an increase in net sales compared to the same period of the prior fiscal year. Operating profit decreased compared to the prior fiscal year due to greater advertising spending for digital publications. As with Amusements, the company does have projects in the pipeline to release during the current financial year which should help matters. In addition to this, releasing the strategy guides for titles like Shadow of the Tomb Raider, Just Cause 4 and Kingdom Hearts 3 will also increase sales of the publication arm. Finally, there is merchandise, which has seen a YoY sales fall of 31.9%, or ¥0.7bn with just ¥0.1bn of income. It has been indicated that the cause of such a fall is due to a high-bar set last year when character-based merchandise was released. New items based on upcoming titles could help matters, though unlikely to the same level of the segments. The coming three quarters of the current financial year are likely to be a little mixed, though certainly better than this quarter. While I don’t know why, or if it was even an option, but Square Enix only published the hugely successful Octopath Traveler in Japan. The international release was published by Nintendo (TYO:7974). Co-developed by Square Enix and Acquire, the game has sold over 1 million copies and has been selling out of physical copies worldwide. It reached the stage where the company actually issued an apology to fans. For other quarters there are a few other major titles that will be released. These include Shadow of the Tomb Raider which will see a global release next month. Following that, Just Cause 4 will be released in North America and Europe on December the 4th, with Kingdom Hearts 3 coming out in January 2019. These are all major titles with the potential to add a huge boost to their respective quarters. Outside of video games, two new amusement machines are in the pipeline, as well as other new items for publication, which will boost both segments. The core issue that the company needs to face head-on: they don’t make or release enough of the titles that originally brought them huge success. In 2014 the success of Bravely Default had the company say they would refocus on RPG titles. Four years later with little of note, Octopath Traveller (from the same developers) is having the exact same effect. At the recent earnings conference, the news is that Square Enix said to expect similar games to Octopath Traveler in the future. A lesson learned twice and hopefully this time one the company will take on board.